Edinburghfestivalfringe Pubs page welcomes you whether it is a night on the town or live music in Edinburgh or historic pubs. Our aim is simple, to help you find your way around our fabulous, city pub scene. Eat, drink and be merry for tomorrow it's pies. In Edinburgh whilst visiting pubs only one thing you need to remember, whiskey, because it is our national drink is usually less expensive than beer. Edinburgh Pubs sell a large range of Malt whiskies and blended whiskies the "water of life". Edinburgh has pubs to suit every taste, you can drink in historic pubs such as Deacon Brodies (picture Below) or take yourself on a tour of the old town including the Three Sisters in the Cowgate and the Black Bull and Beehive in the Grassmarket. If you are staying in the New Town George Street has many Pubs such as the Standing Order (great prices no music), The Dome, Madogs and many, many more. The Royal Mile leading down from the castle is where you find a fast array of pubs to suit every taste. The Old town usually has cheaper pubs to drink in than the new town. All pubs in Edinburgh are non smoking although many now have beer gardens or facilities where you can smoke outside. You can drink almost 24 hours a day in Edinburgh so you just need to find where the party is at. Edinburgh like any Capital city provides for all tastes. Clubbing, Pubs, or more exotic taste visiting edinburgh will help you to find your prefered choice. Some stag nights end up at the West Port for exotic dancing and hen parties end up in the Grassmarket whilst those visitors looking for a more upmarket night out spend the night on George street. Milnes Bar on Rose Street is a popular choice for locals. 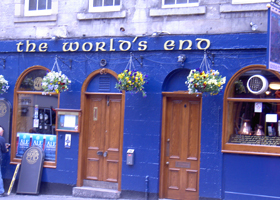 Edinburgh has a variety of pubs for the yound and trendy. Edwards at the West End of Princess Street The Dome on George Street. The Q bar, on Leith Street and Walkabouts at the Omni Centre to name but a few. George the IV Bridge has Frankensteins. Drinking in Edinburgh's New Town is a great experience form Rose Street World renowed as a street of pubs to George Street Fashionable and Trendy. There are so many Pubs that will satisfy every taste. This area of town has everything form Cocktail bars to Cosmopolitan Venues. Try the Cafe Royal for old world charm or the Dome for a mixture of drinking and dancing. There are a number of Pubs and Venues that offer live music in Edinburgh. Everthing from Jazz to local Bands. Bannermans in the Cowgate is a great venue for Bands in Edinburgh. Drop Kick Murphys on Merchant Street also has live music at the weekends. The Saltire a traditional Pub on Rose Street also has live music.